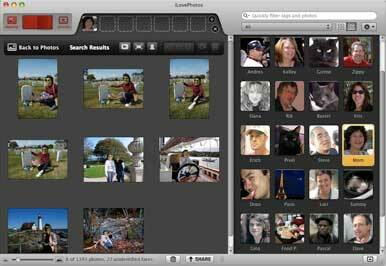 Chances are you’ve probably heard about the Faces feature in iPhoto ‘09 ( ) that makes it quick and easy to find all photos of a particular someone in your iPhoto library. But if you don’t have iPhoto ‘09, iLovePhotos can give you a similar result for free, but with more manual effort. iLovePhotos uses face detection technology to help you organize photos based on the people, places, or things in them. It also plays slide shows and lets you share pics on iLovePhotos.com or Facebook. Just import photos manually or have iLovePhotos sync with your iPhoto library (it doesn’t move or modify the originals); once finished, face detection kicks in, analyzing your collection and marking any faces it finds with a tag box in Photos view. iLovePhotos uses face recognition to organize your photos. With my collection, the app had pretty good face-detecting success, as long as people weren’t facing sideways or slightly obscured by an object (like when singing or drinking a beer). You can mark anything the app misses yourself by double-clicking a photo and drawing a tag box around any face. While it didn’t detect my pets’ faces, it did mark statues, places where it recognized some resemblance of a face in odd bits, and even the torso of a shirtless guy. To identify (or tag) faces, switch to Tagger view, select a detected face, click a slot in the Tagging pane, and then type the name of the person in the dialog to create the tag. Unlike with iPhoto, you’ll need to manually tag all other faces of that same person individually, which can be tedious if you have a lot of photos. Thankfully, you just have to do it once. To categorize a face with a name in a bunch of photos, I found it easiest to Command-click all same-person faces in the Tagger pane and then click his or her tag in the Tagged pane to tag them all. You can also tag images by location, event, or subject matter. Once finished, you’ll be able to quickly find all photos that contain someone or something by dragging one or more tags to the search bar in Photos view. iLovePhotos performed well in Leopard (which the developer recommends using), with a few minor bugs. But I did come across some significant known bugs in Tiger (Blue Lava is working on them), so gauge your use accordingly.